Joss Christensen, Gus Kenworthy, and Nick Goepper talked Tinder. For U.S. athletes looking for love in Sochi on Valentine's Day, happiness may only be a few swipes on a cell phone away. 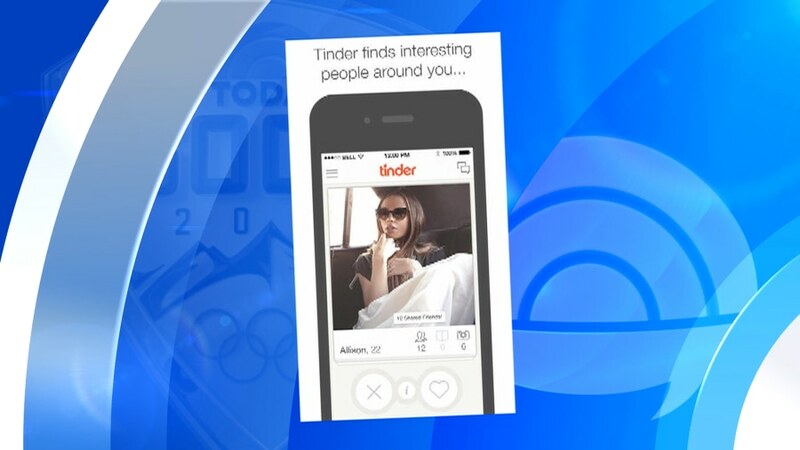 The dating app Tinder, which helps users browse all the single people in your area, has become a primary activity during downtime for athletes in the Olympic village. Profiles contain a photo and some basic facts, and users can decide whether they are interested by swiping to the right (yes) or to the left (no). If two people swipe to the right on each other's profiles, they are connected to a private chatroom and can take it from there. 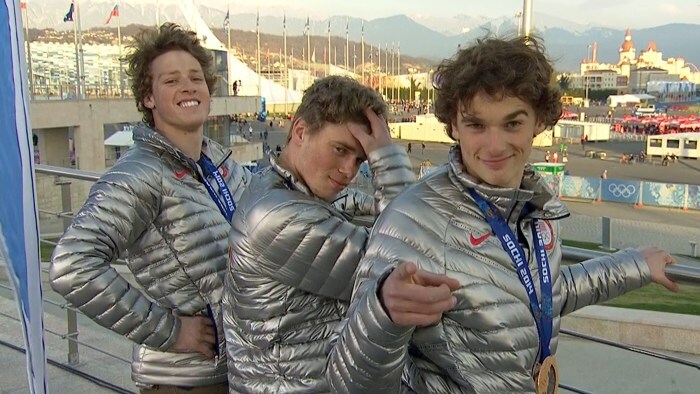 The three American skiers who swept the medals in slopestyle on Thursday, Joss Christensen, Gus Kenworthy and Nick Goepper, all admitted to being on Tinder. "I guess it was the first thing people did when we got to the village — we checked Tinder,'' Kenworthy told TODAY.com. When he's not trying to save the stray puppies of Sochi, Kenworthy has spent time amusing himself on the dating app — though it hasn't produced any love connections yet. "For me it's definitely more the game aspect that's fun,'' he said. "Who you think's hot, see if they do, too. I'm not sure how much further it goes than that for me." But Kenworthy says he hasn't exactly been lonely, despite a lack of Tinder success. "Love is in the air," he said, hinting at a potential Sochi romance. "You know my girl Gracie (Gold) is walking around. We've been hanging out together." For Christensen, using Tinder was a little awkward at first when he started browsing profiles. "It's the normal crew we're used to seeing,'' he told TODAY.com. "It's all the Americans we're used to traveling with, so it was a little weird." And the app seems to be used mainly by U.S. athletes, even though athletes from all over the world are living in close proximity in the Olympic village. "I'm not sure the rest of the world is into Tinder as much as the Americans,'' he said. Nevertheless, the buzz around the app since the start of the Sochi games has led to a 400% day-over-day increase in new users, founder Sean Rad told the Wall Street Journal. But he's still going the old-fashioned route as well — soliciting dates on air. Appearing with Christensen and Kenworthy on TODAY Friday, he urged people to reach out to him on Twitter using the hashtag #IWantToDateNick. "Come on guys, I need a Valentine,'' he said. While the younger U.S. athletes have taken to Tinder, it's not for everybody. "I've heard some whispers of Tinder in the athletes' lounge,'' U.S. luger Matt Mortensen told TODAY.com. "I'm a taken man. I'm going to stay away from the Tinder world." "I made an account like months ago on the advice of some of the bobsledders,'' U.S. luger Preston Griffall told TODAY.com. "I just laughed. I haven't gotten on it, but now I'm curious." Other athletes are just having fun with the whole craze, including U.S. luger Kate Hansen, who made a joke of it on Instagram when she posted a photo of herself holding hands with U.S. teammate Jayson Terdiman, with the caption "Tinder. Oops." "I'm not actually on Tinder,'' she clarified for TODAY.com. "We've been hearing a lot about Tinder, that some of the athletes are on it, so my teammate and I kinda posed for this photo as a joke...He actually has a girlfriend and I have a boyfriend." And while the Tinder field is crowded in Sochi, not everyone is interested in their matches. "I've actually met a lot of interns for NBC and other media who are Tindering athletes," she said. "This one intern was showing me her matches, and they are all athletes. The athletes I know who are on there are only swiping for other athletes. They aren't interested in people who are with the media, and most of them end up meeting through mutual friends anyway." Meanwhile, Rebecca Torr, one of the athletes who launched a frenzy by tweeting about looking for Tinder matches, took to Twitter to make it clear she was kidding — while jokingly also sharing a picture of herself playing with the app one last time before leaving Sochi. Meanwhile, even Tinder co-founder Justin Mateen seems to think the hype among Olympians has gotten out of control. "Tinder is a great way to meet new people when you're traveling and want to get the most out of your experience in a new city," he reportedly told TMZ, "but for now, focus on giving it your all while competing." Yet, considering the tales of sexcapades at the Olympic Village over the years, it's no surprise Tinder has caught fire. So, just how into it are the athletes? "You should ask them in a couple days,'' Mortensen said. "Or about nine months,'' Griffall joked.